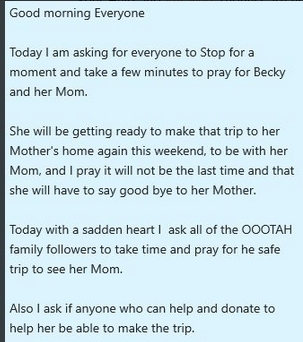 Using her mothers illness as a way to sucker more donations .... This woman has no morals. Words can't describe what a total P.O.S her and her sidekick simpleton Fred are. Go on a diet Becky you obese charlatan that alone should save you a small fortune ! And get a real job while you're at it instead of making a living of the stupid and gullible ! You truly are scum.